Can you tell when shocks, struts need replacement? Q. My Impala has about 88,000 miles on it and it is not riding as well as it used to. I have noticed this lately, especially with how bad all these roads are right now. I was told I might need new shocks and struts to correct this problem. It seems like I don't have enough mileage to need such a major repair already. What do you think? A. Your car is right in the sweet spot for needing shocks and struts. In fact, most suspension manufacturers indicate that at 50,000 miles the performance of the shocks and struts is starting to degrade. This is not true for every car and every driver but it is possible they could need replacement that early. 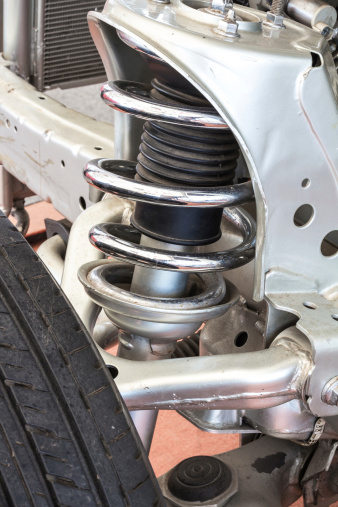 It's fairly easy to determine whether or not you need to replace the shocks and struts. Remember the job of the shock and or strut is to keep the tire in contact with the road and to control the bounce. There are seven handling characteristics that when present are a pretty good indicator. 1. Body roll. You would notice excessive leaning when making a lane change. In severe cases it could cause a loss of control. 2. Traction loss. This condition would show up on a firm acceleration where the drive wheels might come off the ground and cause a skipping sensation. 3. Harshness or buckboard ride. This is what I think you were describing in your question -- the car just doesn't ride good anymore. It's either kind of bouncy or just plain harsh. 4. Nose dive. You will notice this on stopping. The nose of the car just dives to the pavement when braking, totally upsetting the balance of the vehicle, which is actually increasing your stopping distance by 20 feet or more, depending on how fast you are going and how worn out the suspension is. 5. Bottom out. If you have been driving on our winter-ravaged roads, you may have experienced this one all ready this spring. The suspension can actually reach the limit of its travel and cause a harsh bottoming feeling. 6. Acceleration squat. This would be noticed again on accelerating and cause the back of the car to squat down again, upsetting the balance of the car and causing potential control issues. 7. Tire cupping. This is where you actually start to see a really bad choppy wear pattern on your tires. Generally once this starts it's hard to reverse and it causes the tires to wear out faster. They can also create quite a bit of road noise. You would definitely want to think about changing the shocks and struts on a high-mileage car before putting a nice, new expensive set of tires on. While replacing the shocks and struts can be a little jolt to the checkbook, it is one of the most noticeable maintenance services you can do to your car. In most cases you will notice the difference the minute you sit down and drive away!